Momentum the UAE has picked up over the years in stimulating the non-oil economy has left it quite unperturbed, at least for now, in the face of low oil prices. The HSBC UAE Purchasing Managers Index, which measures the manufacturing and services sector, was 59.3 points in January against 58.4 in December, indicating that low oil prices had little impact on a large part of the economy. “The pick-up in activity at the start of the year is encouraging, but we continue to expect activity to lose speed into 2015 as low oil prices and weaker demand from key export markets in the Gulf weigh on momentum,” HSBC’s chief Middle East economist Simon Williams was quoted in a Reuters report. “A challenge but not a crisis,” was how Sheikh Saif bin Zayed, the UAE Deputy Prime Minister and Interior Minister, characterised the plunging oil market scenario. He raised some eyebrows when he projected that oil’s contribution to the GDP would drop from around 30 per cent now to just 5 per cent by 2021. That remark, however, did not come as a great surprise to those in the know of UAE’s efforts to diversify its economy. According to the IMF, Abu Dhabi, which depends greatly on hydrocarbon revenues, will see overall economic growth of 5.5 per cent in 2015, while Dubai’s economy is projected to grow by 4.5 per cent this year and 4.6 per cent in the next. Helping considerably the push towards industrialisation and diversification is the investment coming from overseas sources. Minister of Economy Sultan bin Saeed Al Mansouri, estimated FDI contributed 5 per cent to the UAE’s GDP. At the opening of a World Forum for FDI, Al Mansouri said the UAE’s FDI grew 25 per cent in 2014 to more than $13 billion, a size many countries with much larger populations do not receive. One reason for the inflow of FDI is the UAE’s strategic policy to grant incentives to its free trade zones and industrial enclaves. The fact that the UAE has an increasingly modern and expanding infrastructure and a strong economic base has been another major contributory factor. The gusto with which UAE officials scout for investments and partnerships in local and international forums is praiseworthy and impactful. Thanks to the growing FDI stream, non-oil businesses particularly those related to the petrochemical, tourism and aviation sectors, have gained much traction, but that is not to say that the oil sector has not benefited. “Currently over 20 per cent of the largest global firms have made the UAE their business headquarters with the expectation of further flow of FDI into the emirates,” Al Mansouri said. A fine example of a local industrial enclave helping the diversification process is the Khalifa Industrial Zone Abu Dhabi (Kizad). Last November it welcomed a new plant of Brasil Foods, built at a cost of $160 million and with potential to fill 1,400 jobs. BRF is well known in the Gulf through its Sadia brand. Another project on its way is Ducab’s plant in Kizad. The Dh220 ($59.9 million) million Ducab Aluminium Company, when completed by the end of this year, will manufacture electrical conductive (EC)-grade aluminium alloy rods, wires, and bare overhead conductors. Elsewhere, Poland-based Can-Pack Group, recently opened a plant for aluminium beverage cans and glass bottles at Dubai Investments Park with an investment of $54.4 million. 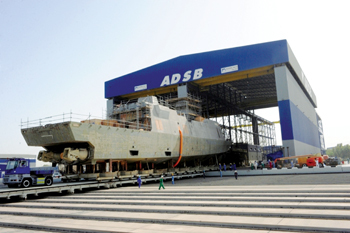 The UAE is making fair strides in the maritime field. As the UAE and the rest of the Arabian Gulf get wealthier, yachting is where some of its millionaires care to spend their money on. The UAE is already a player of note in the yacht manufacturing world and its status will only get more pronounced in coming years. The Dubai Council for Marine and Maritime Industries says the UAE maritime industry is worth more than $61 billion, with 386 boats above $24 million built in 2014, some 8 per cent over the previous ear. Dubai’s prominent position in the yacht market was underlined with the announcement that Comar Yachts would relocate some of its production facilities from Italy to the UAE. Comar Yachts is no mean player, having built more than 6,200 craft to date. “The UAE has the advantage of being a major geographical hub, allowing us to extend our reach not only across the GCC but to India and the south-east of Asia as well,” commented Marco Liello, partner of Comar. “By moving production facilities here we are able to build boats, reach new markets and attract new customers more economically. Meanwhile, the pharmaceutical industry is picking up and fairly well. 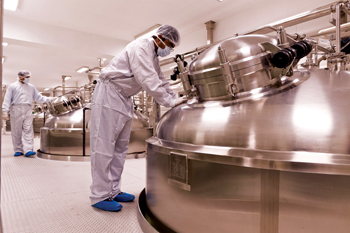 Drug-maker Julphar disclosed to the Abu Dhabi Securities Exchange that its assets had grown in 2014 to Dh3.25 billion from Dh3.05 billion a year ago. The company also completed its acquisition of the Bangladesh-based firm RAK Pharmaceuticals from RAK Ceramics. Julphar, which has 11 factories, including one in Ethiopia and one on the way in Jeddah, obviously sees potential in the Bangladesh operation considering that the market within the Asian country is vast. While the UAE is particularly well known for such non-oil companies as Dubal, Emal, RAK Ceramics and Emirates Steel, it has visions to make a mark in defence and aerospace parts and equipment. In a recent move, a number of state controlled defence companies were merged to create an integrated services and manufacturing business called Emirates Defence Industries Company (Edic). Strata Manufacturing, the advanced composite aerostructures manufacturing facility owned by Mubadala Development Company, has an agreement with UAE-based Premier Composite Technologies (PCT) under which Strata will outsource to the PCT a central function in the treatment of composite materials for the production of Airbus A380 flap track fairings. PCT said the contract with Strata was a first step in a cooperation trail that will secure the UAE’s position in the global aerospace industry.